For many years, people in various parts of the world have harvested cetaceans (whales and dolphins) for food and industrial materials. From the late 1960s to the 1970s, “movements to save the whales” by environmental conservationists increased and in 1982, the International Whaling Commission (IWC) established a moratorium on commercial whaling for an indefinite time period. With this circumstance, the Oceanic Resources Division (ORD) has investigated stock conditions, life histories and the trends in the abundance of whales. These activities have contributed a comprehensive assessment and or in-depth assessment of whale stocks to the IWC Scientific Committee and have revised management approach for future commercial whaling. 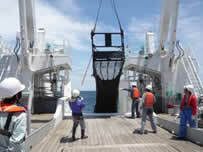 In addition, the ORD is providing scientific information on various aspects of whales and dolphins biology, including: 1)management of Japanese fisheries, such as small-type whaling, hand-harpoon and drive fisheries, which take small cetaceans (not managed by the IWC), 2) management of whale watching activities in the coastal waters of Japan, 3) conservation of cetaceans caught incidentally, and 4) development of　methods for oceanic ecosystem management. Current fisheries management needs to consider the conservation of　marine ecosystems as well as the sustainable utilization of marine living resources. The ORD is in charge of scientific activities for the management of high seas demersal fisheries in the North Pacific,　Atlantic, Antarctic and other ocean basins. Scientific survey, biological sampling and data analysis are conducted to assess the current status of fisheries resources and oceanic ecosystems and to evaluate and manage the fisheries impacts on the ecosystems.